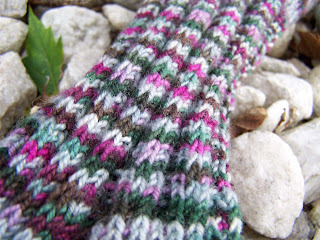 I have finished the first of the Tidepool Revisited socks. I think these are turning out nicely. It is interesting though, the striping on the cuff was different than the striping on the foot. 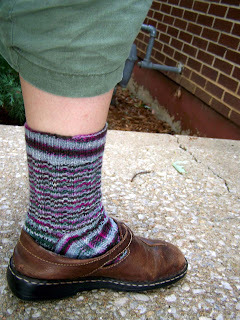 Both the cuff and the foot have the same number of stitches, the only difference is that on the foot half of the stitches are in stockinette stitch, while on the cuff, all of the stitches are in the slip-stitch rib. At first I was unhappy with this difference in the stripping. So I had to let go and just let the yarn do what it wanted to do.